This beautiful and unique home wraps around a large central courtyard. 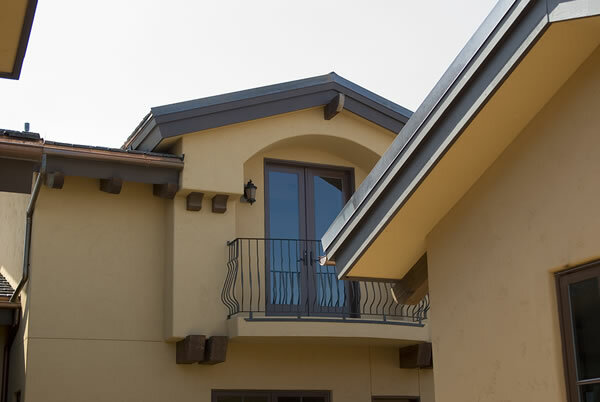 The exterior is composed of stucco and stone veneer with wood details on the outer walls, with slate tiles on the roof. It has many unique features, but the one that stands out the most is the dining room. It's a perfectly circular room, a portion of which projects from the house and looks out to the courtyard. The ceiling in this unique room vaults all the way to the roofline, and the round roof over it is clad in copper. 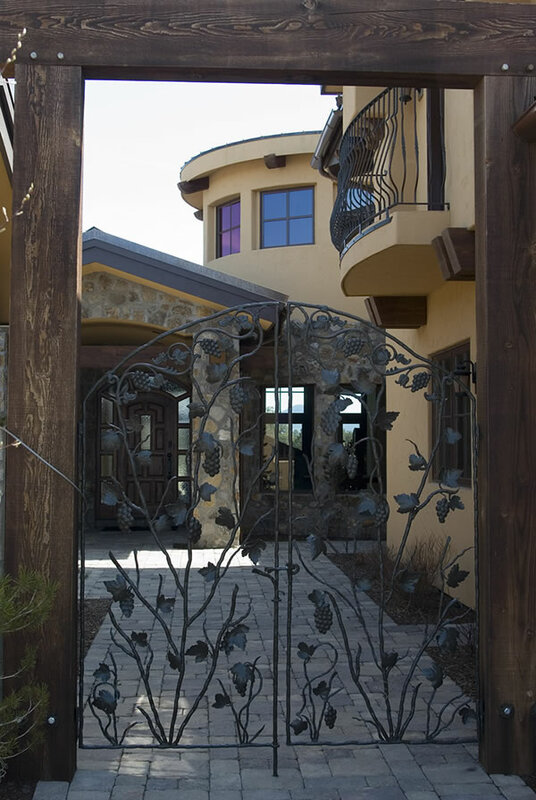 Iron gates at the front of the house open to a lovely courtyard that passes between a small casita and the attached 2–car garage, before opening up as you approach the front door. 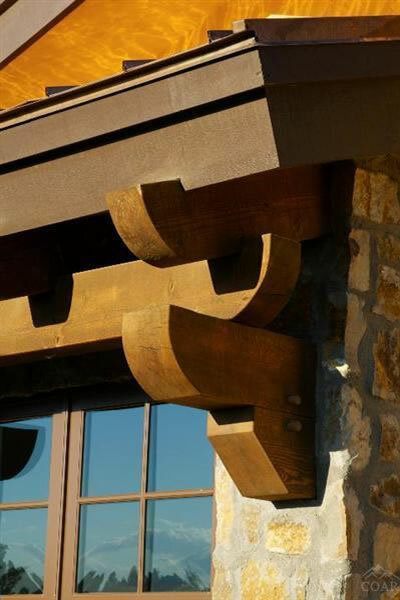 The covered entry is supported by two elegant columns wrapped in battered stone. Upon entering the foyer, your view straight ahead is into the dramatic sunken great room, and through its stacked windows to the view beyond. 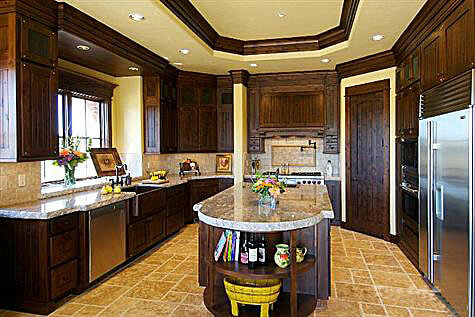 This room features a large fireplace flanked by built–ins on the left, and a wet bar with wine storage on the right. Two pairs of glazed doors open to the rear of the house, while a third pair opens to a lovely terrace with a wood–burning fireplace. 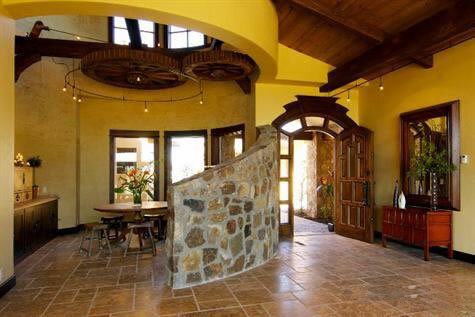 The dining room is separated from the foyer and gallery by a partial–height round wall covered in stone veneer, as well as a round wall higher up that matches the interior walls. As you can see from the photo, the partial–height wall descends as it wraps around, revealing more of this unusual room as you come further into the house. Three large windows in the dining room face the courtyard, while three windows further up the wall bring in even more natural light. 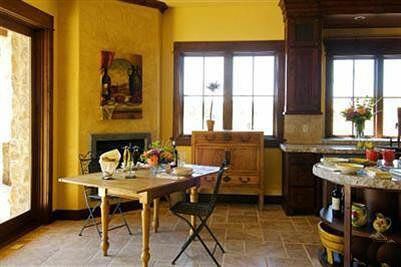 An open gallery between the great room and the dining room leads to the kitchen and morning room. The kitchen includes a large center island and a walk–in pantry, and both this room and the morning room are warmed by a gas fireplace in the corner. Bump out windows over the sinks look out to the side yard, which can be accessed from the kitchen through a pair of glazed doors. A hallway between the kitchen and the other living areas leads past a study with a vaulted ceiling and a closet, to a mudroom area that includes a laundry, a powder room, and a closet. The stairs to the upper level are located here as well, and a door next to the laundry opens to the 2–car garage. The other side of the house is devoted to the master suite. Doors off the gallery open to an alcove with a display niche that's open to the master bedroom to the right and the master bath area to the left. The bedroom has lots of windows for natural light and views, glazed doors leading to the rear yard, a gas fireplace in the corner, and a bar sink with cabinets. The master bath area – which can also be accessed from the courtyard – features two widely separated sinks, a soaking tub beneath a pair of windows, a large shower, and a completely private toilet. A huge walk–in closet off the bathroom includes a stacked washer and dryer as well as a center table with drawers and cabinets. 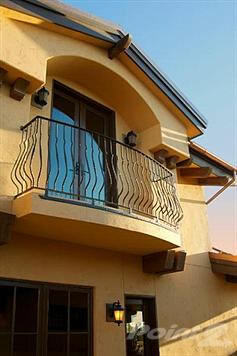 If you choose to build the bedroom suite above the attached garage, this will add 642 S.F. It has a wet bar with built–ins, a full bath, a walk–in closet, and a large sitting room with a private balcony that looks down on the courtyard. There is also a 623 S.F. casita off the courtyard that was used as an office (with another fireplace, of course!) by the original homeowners, but since it also has a full bath and closet space it would work equally well as a guesthouse or an in–law apartment. The rooms in this detached building have ceiling heights of 9'. A second (detached) 1–car garage is separated from the attached garage by a flagstone auto court. This garage, should you decide to build it, includes a space to store a golf cart. This stunning house features beautiful detailing and materials on the exterior, and a breathtaking interior. The outline of the house is irregular, producing interesting spaces and great views. The 2–car garage (and an optional 1–car garage) on one side, and a separate one–bedroom full suite on the other wrap around and enclose a large open courtyard at the front of the house. In addition to the separated suite (an ideal in–law apartment if you need one), there's a large master suite on the main level, and an optional bedroom suite above the main garage that could be a guest suite. 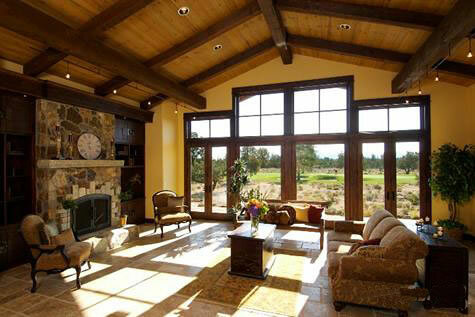 Other unique features include a round dining room with a two–story ceiling and views out to the courtyard; a great room with a vaulted ceiling, a fireplace, and a built–in wet bar; and corner fireplaces in both the master bedroom and the morning room off the kitchen.